Please find below the call for participation at the 3rd Summer Datathon on Linguistic Linked Open Data. ... of giving people from industry and academia practical knowledge in the field of Linked Data and its application to natural language data and natural language annotations, from areas as diverse as knowledge engineering, lexicography, the language sciences, natural language processing and computational philology. Tutorials and supervision by leading experts on Linked Open Data and its application to language resources, human language technology and the language sciences will be provided. The final aim is to enable participants to migrate their own linguistic data and publish them as Linked Data on the Web. This edition is supported by several international projects addressing different aspects of natural language processing, lexicography and digital humanities: The Research Group “Linked Open Dictionaries (LiODi)”, funded by the German Federal Ministry of Education and Research (BMBF), the Horizon 2020 Research and Innovation Action “Prêt-à-LLOD. Ready-to-use Multilingual Linked Language Data for Knowledge Services across Sectors” and the Horizon 2020 Research and Innovation Action “ELEXIS. European Lexicographic Infrastructure”. Scholars, students and practitioners from any field of lexicography, the language sciences, natural language processing, knowledge engineering, and computational philology are invited to apply for participation. For further details on fees, the registration process, information on the venue, the program and points of contact, please see under https://datathon2019.linguistic-lod.org. Participants are encouraged to submit a short abstract of their ideas for the datathon (description of possible resources to be converted, linked or reused during the datathon, ideas for use cases, etc.). A selection of them will be presented during the event and proposed as miniprojects to be developed during the datathon. 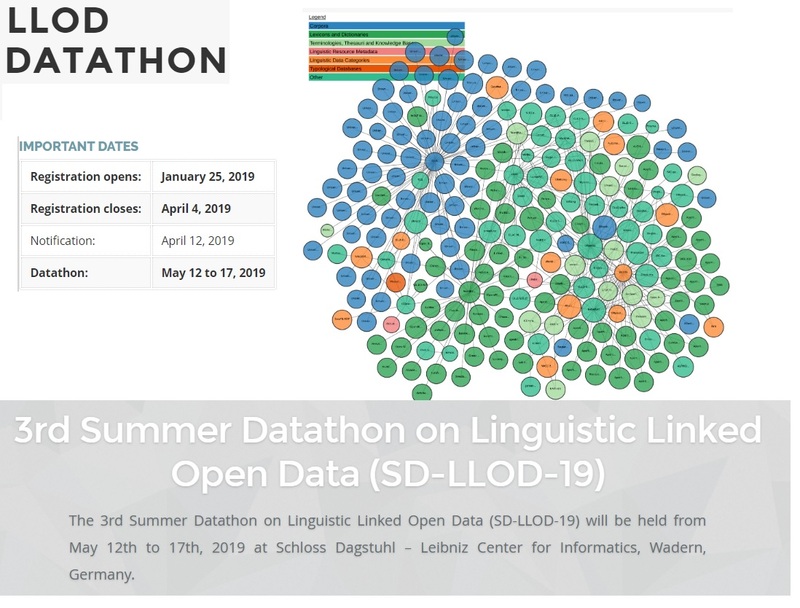 For more details check 3rd Summer Datathon on Linguistic Linked Open Data. ISA² develops interoperability solutions that can be reused free of charge. Would you like to know who is already using the solutions?